Comfort food doesn’t have to heavy (or unhealthy) and this prosciutto pasta demonstrates just that. The lightness of the escarole and beans makes it a delicious dish to enjoy throughout the year and is easy to whip up in as little as 30 minutes. 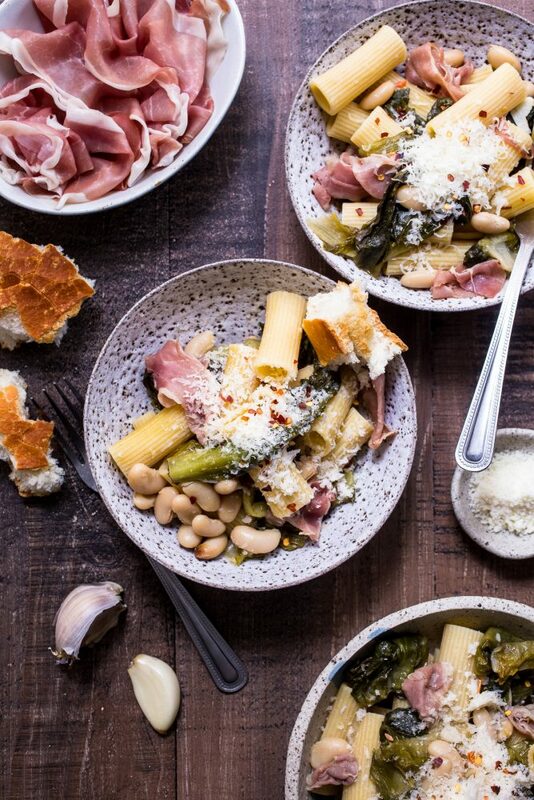 The combination of savory Prosciutto di Parma, earthy escarole and creamy Parmigiano-Reggiano make this classic prosciutto pasta an instant favorite. Take a look at some of our favorite wine and beers for pairing inspiration. This recipe comes from Girl in the Little Red Kitchen, who was inspired by her visit to Specialist retailer DiPalo’s Fine Foods in New York City after speaking to Lou DiPalo. Bring a large pot of salted water to boil and cook the rigatoni according to the packages directions. Drain and set aside. In a large sauté pan or braising dish over medium heat add the olive oil and sliced garlic. Sauté for about 1-2 minutes or until the garlic starts to brown lightly, stir in the red pepper flakes. Roughly chop the cored escarole and add it to the pan with the white wine. Cook for about 3-4 minutes or until the escarole begins to wilt down. Pour in the chicken stock and continue to cook until the escarole has wilted completely, stirring occasionally. Stir in the white beans and season lightly with kosher salt and black pepper. Cover the pan and braise for about 15-20 minutes or until the escarole is cooked down and tender and the stock has reduced by about half. Add in the pasta, Parmigiano-Reggiano cheese and tear the Prosciutto di Parma into small pieces and toss together in the pan to coat evenly. Divide between 4 bowls, sprinkle the top with additional grated cheese and a touch of red pepper flakes if desired.